This is the first Christmas I have made my own homemade mincemeat for mince pies, and it’s absolutely superb. Homemade mincemeat is an absolute doddle to make and the beauty of making your own is that you can customise the ingredients to suit your tastes. My friend Jen inspired me to have a go at making mincemeat after telling me she makes her own each year without suet and mixed peel. I’m not a fan of the texture (or appearance) of suet in mincemeat, or the flavour of mixed peel, so I decided my recipe wouldn’t have any either. This has the added bonus of making the mincemeat suitable for vegetarians and vegans. After having a good look at lots of mincemeat recipes online, I decided to add equal quantities of sultanas, raisins and currants to my mincemeat. I’m a big cranberry fan so I added lots as well - they give a lovely flavour. I think dried cherries would also be amazing in mincemeat, I’ll give that a go next year. Jamie Oliver’s recipe includes dried blueberries and figs - I think you can be quite experimental as far as the dried fruit goes. I love nuts so my recipe includes lots of flaked almonds which give a nice crunchy texture. There’s also lots of coarsely grated Bramley apple to balance the sweetness. I coarsely grated my apple instead of chopping for two reasons - the first is that it’s quicker and the second is that it doesn’t need to be cooked down at all (it will cook enough when it’s baked in mince pies). I also left my apples unpeeled as I like the flashes of green in the mincemeat, as well as the added texture. A few recipes I came across added fresh chopped rosemary which I also included - it gives a subtle herby background flavour that you can’t quite put your finger on. I added lots of orange and lemon juice and zest which gives the mincemeat a citrusy lift. Spice wise, I went for mixed spice and cinnamon, which I felt was enough, but you could add extra ginger or nutmeg or both if you like - have a taste and decide. Traditionally, mincemeat recipes contains alcohol to add flavour and act as a preservative. I used brandy - which made the whole thing smell and taste like Christmas - but you could use port or rum. 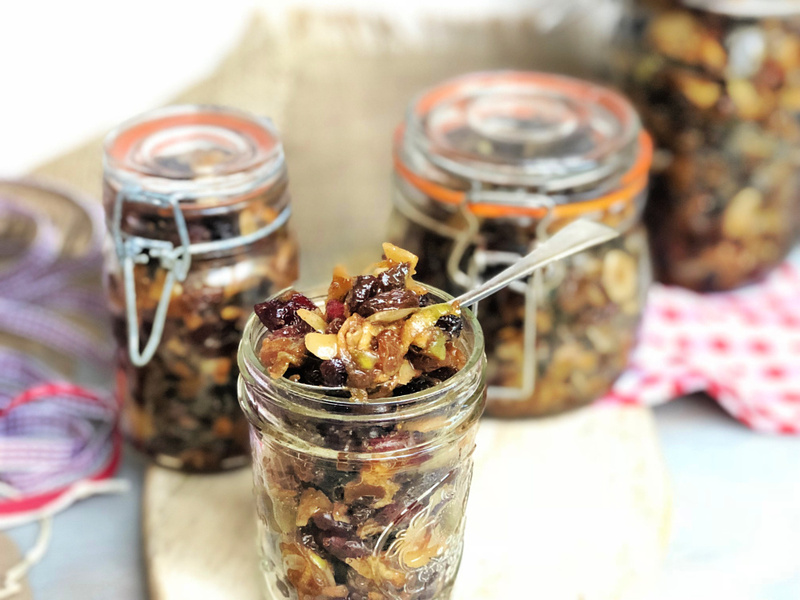 I saw a few recipes for alcohol free mincemeat which substituted the booze for orange juice or grape juice, so you could try this if you prefer to keep your mincemeat teetotal. However, it might not keep quite as long. 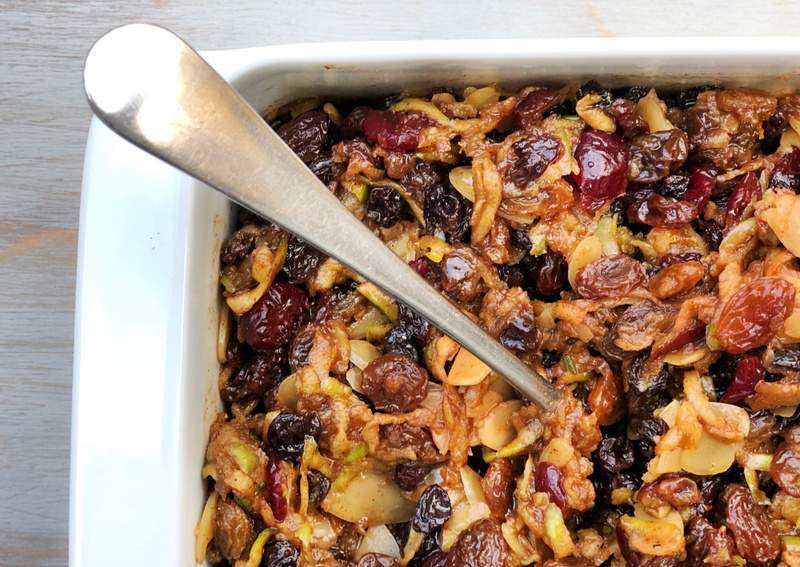 There’s no cooking involved in this mincemeat recipe, but you will need to leave it in the fridge overnight before you decant it into sterilised jars (I wash my jars out at put them in a low oven for ten minutes to sterilise them). I found that a super large oven dish was easier to mix everything together in and store in the fridge. Mincemeat is much better if it’s left for 2 weeks before you use it because it allows the flavours to mature and it will taste much better. I keep my jars of mincemeat in the fridge, just to be on the safe side, because it isn’t hot when it goes into the sterilised jars so doesn’t make a seal. Finally, this recipe makes a whopping 4kg of mincemeat, but it’s very easy to scale down if you don’t think you will use it all up. Make sure you have enough jars to store your mincemeat in before you start making it. Clip top preserving jars are very cheap to buy and look pretty if you wish to give some of the mincemeat away as gifts. In your largest roasting dish mix all the ingredients together really well so everything is combined and all the ingredients are evenly distributed. I find a flat oven dish is much easier for this job. Put clingfilm over the dish and pop in the fridge for around 24 hours to allow all the ingredients to marinade. If you can, it helps to get the dish out and stir it once or twice during this time. Decant the mincemeat into sterilised jars and store in the fridge for 2 weeks to allow the flavours to mature before using.